On March 30, 2017 at 12:14 p.m., Galloway Township Police Department responded to motor-vehicle collision at the intersection of US Route 30 (White Horse Pike) and Cologne Avenue. According to Police a 2014 Ford Focus operated by Michael S. Daddario, 37 of Galloway, was traveling eastbound on Route 30 when he turned left onto Cologne Avenue into the path of a 2003 Harley Davidson that was traveling westbound on Route 30. The motorcycle was being operated by Aaron H. Budman, 28 of Gloucester City. 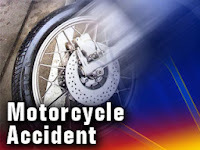 Crystal V. Unis, 34 of Gloucester City was a passenger on the rear of the motorcycle. Both Budman and Unis were thrown from the motorcycle. Budman and Unis were transported to Atlantic Regional Medical Center, City Division, for serious injuries. Budman and Unis were wearing non DOT approved helmets. Daddario was wearing a seatbelt.